Place a 12-inch non-stick skillet on stove top (skillet needs to be oven-proof). Add about 1 tablespoon oil and bacon pieces. Cook bacon until almost done then add onions. Season to taste. Saute onions until cooked through and bacon is crispy. Add the precooked asparagus to the skillet and heat them through. In a mixing bowl add the 12 eggs and whisk. Season to taste. Add 1/2 cup water to the eggs and continue whisking until eggs and water are blended. Incorporate 1/2 of cheese mixture into whisked eggs Add egg mixture to skillet. On medium heat, cook eggs for about 2 minutes, scraping the sides and bottom with heat-resistant spatula. When eggs are mostly cooked but still very wet, stop stirring. You want to see cooked egg scattered throughout, but loose egg in between. Continue cooking on stove for another minute so underside sets. Turn off stove top heat. Place skillet in a 335 degree oven for approximately 15-20 minutes and bake. You can also use the broiler method, but I prefer baking. If using the broiler method, Put skillet under broiler (skillet should be 4-6 inches from broiler). Watch carefully while top browns. This will take 2-4 minutes. Remove skillet from oven and let sit 5 minutes to finish cooking in center. 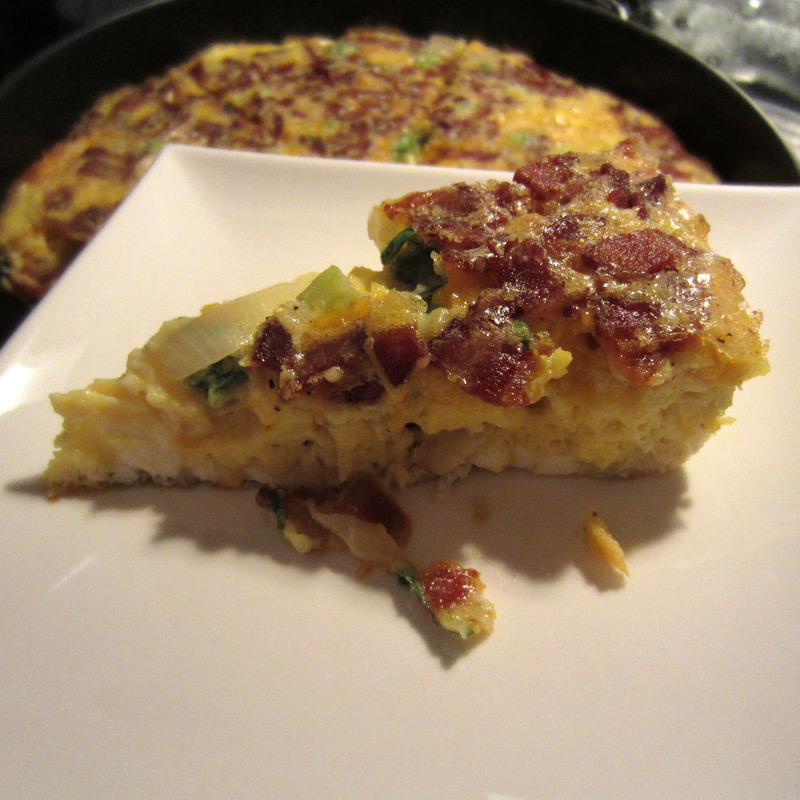 Allow frittata to cool slightly before cutting into pie shaped wedges. Serve hot or cold. To reduce calories I suggest using the egg substitutes and turkey bacon instead of pork bacon. Calories per serving will really depend on what you put into the frittata. On average, if using turkey bacon and low-fat cheese, you’re in neighborhood of 275 calories per serving.